Betel leaves is an inherent part of India, everyone knows and tasted the paan once in his lifetime, you will rearely meet a person who has not tasted paan in his life. So here is new shop in Karvenagar of Pune called as The Betel Leaf : Paan Dessert Shop which provides yummy 400 types of paan. With innovation someone can really win heart of Punekar’s. 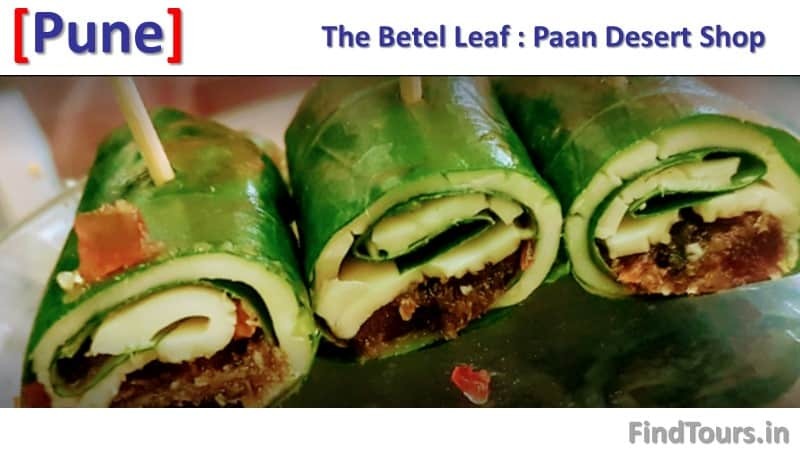 So the Betel Leaf – Pune has a variety of innovative spins on offer including the tiny desi mouth-freshener and typical Indian dessert- Paan, a dessert made in betel leaf which is known to be very good for digestion. All the paan ingredients are in-house made by them thereby maintaining the true Indian taste, you must visit it once after lunch or dinner. The staff of The Betel Leaf is really courteous and prompt at providing any assistance. They readily answer any queries or questions that you may have. I have even seen foreigners visiting this shop alongwith the locals. As I said they have almost 400 varieties of Paan available … to name a few they provide …. Pay for the product or service with ease by using any of the available modes of payment, such as Cash, Debit Cards, Cheques, Credit Card.